What is Glacier Blue® Devonian Sandstone? Need Samples? Visit our Sample Request page. Welcome to the October issue of our newsletter! In each issue we present you with interesting and informative articles about the various projects architects and designers are working on around the country. If there is a project you would like to share with us, please feel free to contact us and tell us about it. We might feature your project in one of our upcoming issues of this newsletter. 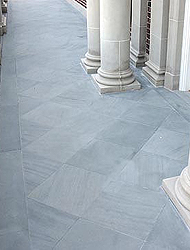 To learn more about our "high-end" cut-to-size Glacier Blue® Devonian Sandstone products, please click here to visit our website. John Mclean Architect provides state of the art design precisely balanced by human needs. His practice of both architecture and industrial design is definitive and long-term in problem solving. These strengths are clearly displayed in his dynamic portfolio. This office employs state of the art technology including computer-aided design and drafting (CAD). The firm has an excellent record of meeting deadlines and operating within the client's cost restrains. Mclean's perspective, ¦ melding architecture and industrial design, brings a unique force to the design leadership he exerts on all projects. 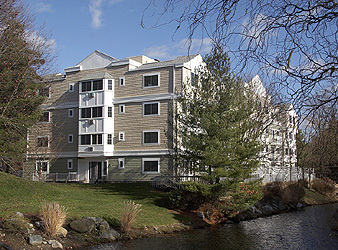 Architect John Mclean was asked to renovate the Pondside Club West Condominium in White Plains, NY after the 48-unit, 4-story apartment building developed water leaks and numerous other issues due to faulty construction. Mclean was also asked to design a new entry way, which turned out to be the focal point of the building. Mclean, the Architect reported, "The entryway is completely different from what was there before, which was planters on either side of the steps that were poorly constructed. The original steps were deteriorating with the treads popping off the substructure of the steps. I decided to open this all up, clean up the area and use solid stone slabs properly set. Another problem was poor drainage, which was addressed with the setting of the stone slabs. Handrails were designed using 316 stainless steel so that there would be nothing that would rust. My aim was to do things correctly, and elegantly." At the conclusion of the entry project, "The owners are very happy with the design and the curb appeal that has been created. The design of the new entry way, which was constructed from solid, contrasting colored bluestone slabs, echoes the forms found in the building. 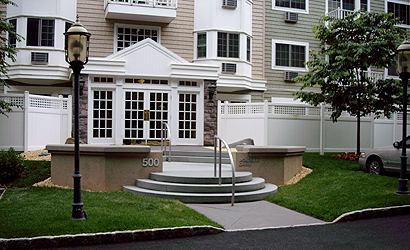 The vision was to create a spatial openness to the walkway and a gentle path from the curb to the building. The entry way and the redesigned building, are the jewels of the whole complex." Mclean worked with the contractors on the renovation of the building. He explains, "I worked very closely with the contractor. The client expected me to be there, so I was scaling the scaffold on a regular basis, looking at the work and going through it on a regular basis. Based on the way the building is behaving, and the way the building looks right now, I would say that the contractor and I did a great job." Mclean further reported, "As a result of the renovations on the building, the clients informed me that their heating bill had significantly dropped. Several years have gone by since the renovation and the building is functioning as it was originally intended to be. It was a well done project and I know that the client is happy with the outcome." Mclean completely redesigned the exterior of the building, right down to the metal studs in the walls. The new design emphasizes each floor plan and the integration of the exterior wall components that constitute the facade and a new entry-way into the building. Mclean explains, "The building was built around 1989 and it had a lot of construction problems that were related to builders not following the original plan. The result was that there was heat loss and significant water damage. I was asked to come in and correct the problem, which I did. Once the building project was completed, I proposed doing a new entryway so that it would look compatible with the redesigned building." There was a process Mclean had to go through in order to make the building more energy efficient. He explains, "We did several things. First of all, new insulation was installed in the walls and then a layer of exterior insulation was applied over the whole structure so that there was a real definite thermal interruption or break in the thermal conductance from the interior to the cold outside. The only place where I couldn't do that was with the balcony slabs. Those were the only bridges that went out from the interior of the structure, because they are steel and concrete. But we were able to successfully get the building watertight and to prevent a situation where, when it rained outside, it would not rain inside the apartments. That's how serious the problem that was corrected had become." "The most critical part of architectural practice," according to Mclean, "is getting the exterior of the building correct, which includes the walls, windows, roofing, and the parapet. The whole envelope of that structure really has to be thoroughly worked out and managed because there are so many ways that water can compromise the structure, both as liquid or as vapor." Since the deterioration of the building was caused by the original contractor who deviated from the original building plan, Mclean had to go back to those original plans before starting the redesign. He explains, "I had to go back to the plans for the purpose of doing an investigation so that I thoroughly understood what was supposed to have been built. I also had to understand how problems could have arisen from the fact that thirty years ago we didn't know as much about the exterior of the construction of the walls of buildings as we do now, especially when using light materials and thin wall construction. Those materials have aggravated the problem because the thermal mass wasn't there to protect the building. We have to be very careful about how we manage water vapor and condensation in a wall, just as we have to do on the exterior of the walkways, the driveways and the water flow of the site. That's all a very significant part of the design process." "There was insulation on the original building, but either it had fallen down because it wasn't properly secured, or it had become wet and fallen down which meant that we had to replace it. That's what prompted the necessity to completely redesign the exterior of the building, right down to the bare bones. We saw the back-side of the sheet rock that was forming the interior wall surface of each apartment, and rusted metal studs which had to be replaced. Each time we moved down in the building, we found something else to correct. Most of the problems were anticipated so we were able to do the project with hardly any additional costs. The project came in on budget and on time, and that was an important aspect that made everyone happy." What happened with the Pondside Condominium is an example of how important it is for contractors to stick to an architect's design, or to seriously question what's on the plan," Mclean adds. "It works both ways. As I've said to my colleagues, even though the project could be divided up into a design phase, the construction plan phase, the bidding phase, and the construction phase, there's design work constantly going on right through the construction phase. There is always something that needs to be adjusted, refined, designed and reviewed. That is what we architects do. That's the importance of construction administration with the architect observing the work and being available to answer the contractor's technical questions." The renovation of the building took approximately 15 months. After that Mclean was asked to design the new entryway for the building, which is the highlight of the building. We hope you enjoyed our informative monthly e-newsletter. For questions, comments or more information, please e-mail or call us today. Devonian Stone of New York, Inc. Copyright Devonian Stone of New York, Inc. 2013. All Rights Reserved. Content may not be copied or reproduced in any way without the written consent of Devonian Stone of New York, Inc.